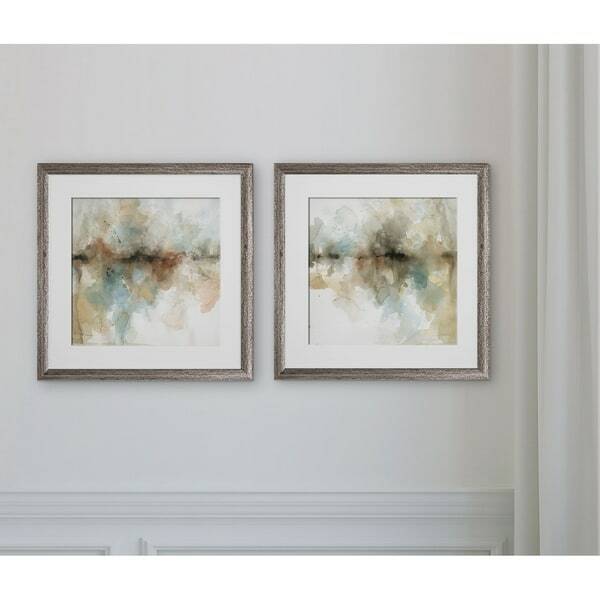 Island Mist -2 Piece Set 2 Custom Framed Prints. 100% and created to last. Individually printed and framed by hand to very high standards. Printed and inspected one at a time utilizing the latest archival UltraChrome Giclee inks Consisting of 2 Total Framed Pieces Each measuring 16''x16'' x .75'' deep Each Piece is Individually Framed Acrylic Glass Each piece includes hanging accessories and is ready to hang. You need only to apply an anchor to the wall of your choice. The prints themselves are very nice, great textural look. However, the quality stops there. The rest is super cheap looking. The frames are a wood grain look, not silver-textured in photos. Also the acrylic is very thin and does not look like glass. Finally overall size is 15 x 15, not 16 x 16 as described. Its a shame the rest of the pictures are of such poor quality, the prints deserve better!